You felt if you were measuring the properties of hydrogen, the most fundamental nucleus, you just measure it and do it as well as you can. 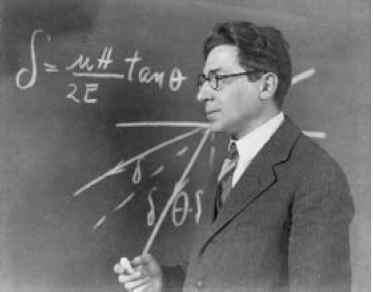 When Isidor Isaac Rabi was a graduate student at Columbia University in the mid-1920s, his eye was on Europe, where intellectual fireworks were illuminating the minds of physicists, animating their discussions, and entertaining their ambitions. This was not the situation at Columbia University, where only a sputtering roman candle occasionally lit the corridors and laboratories of the physics building, Pupin Hall. In 1926, the contrast between European and American physics was like that of the grand finale of a major pyrotechnic display and a simple sparkler. Hamburg, he also met Otto Stern, and he followed Stern's work with interest. On one visit to Stern's molecular beam laboratory Rabi made a casual suggestion to Stern for an experiment, which brought the immediate response: "Why don't you do it?" Rabi was told it was an honor to receive such an invitation from Stern. "I was in no position to refuse an honor," said Rabi.1 Rabi's experiment introduced a novel configuration of the magnetic field for deflecting particles in a molecular beam—a configuration now called the Rabi field. In writing about molecular beams, Otto Stern once referred to "that beauty and peculiar charm which so firmly captivates physicists working in this field. "2 Stern's statement accurately described Rabi's reaction to his experience in Hamburg. Rabi's powerful physical intuition was stimulated by images of atoms moving through the apparatus and once he was exposed to that "beauty and peculiar charm," the course of Rabi's professional life was determined (see Figure 12.1). Rabi returned to the States to join the Columbia faculty in the fall of 1929, just before the crash preceding the Great Depression. 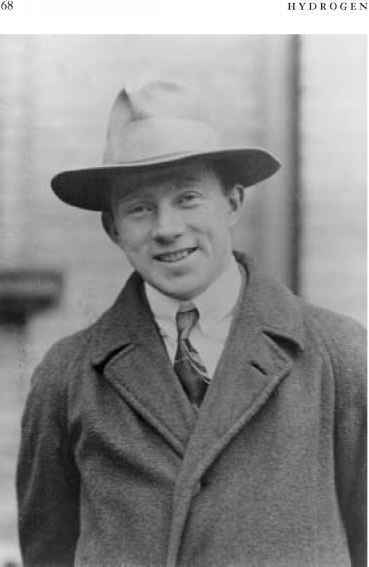 As it happened, while Rabi was still in Europe finishing his immersion in quantum mechanics, Heisenberg left Europe for an extended visit to the United States. His first stop was New York City, where he visited Columbia University. The physics department was seeking a new faculty appointment. They sought a person who could introduce a course in quantum mechanics into their physics curriculum. Heisenberg recommended Rabi. At this time, anti-Semitism worked against the appointment of Jews to university faculties, but with Heisenberg's strong recommendation, George B. Pegram, the chair of the physics department, went against the anti-Semitic prejudice that pervaded higher education and appointed 1.1. Rabi Lecturer in Physics, the lowest academic rank. Figure 12.1 I. I. Rabi. Throughout the 1930s Rabi and his illustrious group of students and postdoctoral assistants carried out a succession of molecular beam experiments on the hydrogens—ordinary hydrogen (H) and heavy hydrogen (D). With ever-increasing accuracy and precision, the magnetic moments of the proton and the deuteron were measured. The culmination of this effort was the discovery of the magnetic resonance method, which portended a rich dividend of applications far beyond anything Rabi or his students could have imagined. That is the nature of basic research: it contains within it unanticipated rewards that often have practical applications. Rabi discovered he could do the experiment in a different way. Stern had used a beam of molecular hydrogen, which effectively canceled out the much larger magnetic moments of the electron and permitted the proton's small magnetic moment to be detected. Stern's experiment required strong deflecting magnetic fields that were difficult to regulate, control, and calibrate. With Gregory Breit, a New York University physicist, Rabi found a way to couple the weak magnetic moment of the proton with the strong magnetic moment of the electron so that the latter effectively leveraged the former. This approach enabled Rabi to employ a beam of atomic hydrogen (as opposed to Stern's use of molecular hydrogen) and weak deflecting magnetic fields (as opposed to Stern's use of strong magnetic fields). Thus, Rabi's experimental procedure avoided many of the complications that Stern had wrestled with. Zacharias had also seen the paper in which Stern's proton result was described and he too was intrigued. Zacharias went to Rabi and said, "Rabi, I'll work with you if you'll work on atomic hydrogen. Atomic hydrogen is as complicated a beast as I am willing to get involved in. "5 Rabi accepted Zacharias's terms and in late 1933, Rabi and his associates began to build apparatus—apparatus that would be changed many times over the course of the 1930s and evolve into the magnetic resonance method. The first hydrogen experiment in Rabi's laboratory had its strengths and weaknesses. A strength was the form of the magnetic field that deflected hydrogen atoms as they passed through the beam apparatus. Zacharias doubted Stern's results because he was skeptical about whether the strength of the strong magnetic field required in Stern's approach could be accurately calibrated. Zacharias conceived a method of producing a magnetic field whose strength could be calculated directly. This was a strength. The weakness was the way the hydrogen beam was detected. The detector was a glass plate coated with a chemical that turned from yellow to blue at the site where the beam of hydrogen atoms impacted upon it. This meant that subjective judgments about color had to be made—where the blue began against the background of yellow. Because of the inherent weaknesses with the first experiment on the proton, the experimental results, reported in 1934, were given with the large uncertainty of 10 percent. But even with the imprecision of the results, they were provocative. Rabi's first measured result of the magnetic moment of the proton was 3.15 ± 0.31 nuclear magneton (nm), larger than Stern's result of 2.5 ± 0.25 nm. The two results did not agree: The largest value consistent with Stern's measurement was 2.75 nm whereas the smallest result consistent with Rabi's measurement was 2.84 nm. Although this difference raised questions that had to be pursued, Rabi's result suggested that the magnetic moment of the proton was approximately three times larger than the experts had predicted. In addition to the proton, Rabi reported the experimental results obtained for the deuteron: it had a magnetic moment of 0.77 ± 0.2 nm with a whopping uncertainty of 26 percent. The results of the first round of hydrogen and deuterium experiments mandated new and better experiments. The proton and the deuteron are, respectively, nature's simplest nucleus and compound nucleus; thus, they are of enormous significance to a thor ough understanding of atoms. The second series of experiments began in 1935. Another change Rabi made to the second series of experiments allowed the sign of the magnetic moment to be determined, that is, to determine whether the magnetic moment was aligned parallel to the angular momentum (positive) or antiparallel (negative). Previously, neither Stern's nor Rabi's experiments could extract this information from their data. Knowing the sign of the deuteron's magnetic moment, made up of the proton's and neutron's moments, would allow them to deduce both the magnitude and the sign of the magnetic moment of the newly discovered neu tron. Since the size of the proton's magnetic moment was three times larger than predicted, whether the magnetic moments were positive or negative was really unknown. "I had people to bet either way," said Rabi.7 To determine the sign, a third magnetic field was added between the two deflecting fields. 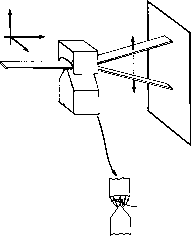 This field, called the T-field, effectively changed the intensity of the detected beam depending on whether the magnetic moments were positive or negative. The results of the second experiment were announced at a January 1936 meeting of the American Physical Society in St. Louis: the magnetic moment of the proton equaled + 2.85 ± 0.15 nuclear magnetons, and the magnetic moment of the deuteron equaled + 0.85 ± 0.03 nuclear magnetons. From these data, the neutron's magnetic moment was deduced to be -2.0 nuclear magnetons. The second round of experiments on the hydrogens not only gave the signs of the magnetic moments, they also gave the size of the moments with greater precision. The uncertainty in the proton's magnetic moment was reduced from 10 percent to 5 percent and for the deuteron, the uncertainty was reduced from 26 percent to 4 percent, which were considerable improvements. The T-field introduced in the second series of experiments on the hydrogens was the sire of the magnetic resonance method. The T-field was a static field and it provided the means to estab lish the signs of the magnetic moments. Rabi used the T-field through 1936 and into 1937 for a number of experiments on other nuclei. There was no competition from other laboratories. Rabi's nonchalance was challenged in September 1937, when C.J. Gorter from the University of Groningen in Holland visited his laboratory at Columbia. Gorter asked Rabi why he wasn't using an oscillating magnetic field rather than the static T-field. Rabi had planned to do this eventually, but other work delayed the construction of new apparatus. "Well," said Rabi later, "I liked what we were doing, but I saw that he [Gorter] might go after it and we might get some competition. So I said, 'Let's do it. '"9 Gorter visited on a Saturday. On Monday modifications to the apparatus were begun. When a beam particle went through the static T-field, the particle experienced the effects of a rotating field whose rate of rotation depended on the speed of the beam particle. Fast particles saw a high rotation rate or high frequency; slow particles saw a slow rate or low frequency. Since beam particles have a range of speeds, each saw a different rotation rate, a different frequency. This made the T-field approach essentially qualitative in character. When the T-field was replaced by an oscillating field, the qualitative method became quantitative. The rate of oscillation was large enough so that every beam particle experienced essentially the same applied frequency. This allowed the experimenters to exercise control, a known control, over the beam particles. Here is how it worked. Beam particles left the source and after passing through collimating slits, the beam particles passed sequentially through three regions. Region 1 was the first deflecting magnet. Region 2 contained a uniform magnetic field with the oscillating field superimposed on it. Region 3 was the second deflecting magnet oriented so that deflections were opposite to those deflections in region 1. From region 3, the beam particles entered the detector. Beam particles left the first deflecting mag net in a particular quantum state. If no quantum transition was induced by the oscillating field in region 2, the beam particles were refocused into the detector by the second deflecting magnet. If, however, the frequency of the oscillating field in region 2 stimulated beam particles to make a quantum transition, the beam particles were not refocused by the second deflecting magnet and thus did not make it into the detector and the detector signal decreased. The magnetic moments could be determined directly from a knowledge of the strength of the uniform magnetic field and the frequency of the oscillating field in region 2 required to decrease the detector signal. Both of these parameters could be determined with high accuracy and precision. With the magnetic resonance apparatus functioning according to expectations, the third series of experiments began on the hydrogens in mid-1938 and they were collecting data by July. Some unexpected results came out of this series of experiments (see Chapter 13). To get maximum exposure for their work, Rabi and his associates gave preliminary results on the proton at a January 1939 meeting in Washington, D.C., deuteron results were announced at a meeting in Seattle in June, and the full-length paper containing the final results was published in Physical Review in September. In this paper, the proton magnetic moment was given as 2.785 ± 0.02 nuclear magnetons and the deuteron magnetic moment as 0.855 ± 0.006 nuclear magnetons. The uncertainty in these results was 0.7 percent (see Figure 12.2). ton and deuteron, key players in the atomic world, brought Rabi near to God. "There is only one proton," said Rabi. percent uncertainties third experiment, 1939: proton 0.7 percent and deuteron 0.7 percent uncertainties. Rabi's experimental results challenged physical theory for decades. Great science coupled with high precision often leads to surprises, and sometimes important discoveries (see Chapter 13). Rabi expressed this well: "You felt if you were measuring the properties of hydrogen, the most fundamental nucleus, you just measure it and do it as well as you can. It was bound to fit into some or other scheme. And, if it didn't, it was significant. Here you have a system that you could understand. There were no complications. Anything I couldn't understand was because there was something to be discovered. "10 Finally, great experiments like Rabi's are characterized by an experimental design that is, in itself, a thing of elegance and beauty. Figure 12.2 The evolution of the magnetic resonance method. The basic Stern-Gerlach experiment of 1922 appears in the upper left (see also Figure 11.1). Rabi's refocusing method of the mid-1930s with the A and B deflecting magnets is shown in the upper right. In the center of the lower left illustration is the T-field added between the deflecting magnets. The lower right illustration shows the magnetic resonance apparatus with a C magnet added between the A and B magnets. An oscillating field existed within the field of the C magnet. The experimental methods developed over the period 1934— 1939 ended with the magnetic resonance method. It was a powerful method that held within it the potential for physical and humanitarian applications. Shortly after World War II, the resonance method was extended in a form that is used today in physics, chemistry, and biology. Still later, the magnetic resonance method was applied to living organisms. Magnetic resonance imaging (MRI) is a noninvasive diagnostic tool that has become indispensable in contemporary medicine. And it all started back in 1934 in Rabi's laboratory. As stated earlier, it is the nature of great research that one cannot predict what basic new insights about the workings of nature will emerge, nor can one dream of what practical applications will follow. The hydrogen atom has been particularly prominent in leading to new basic and practical outcomes. In a poignant moment, Rabi bore witness to an application of his own work in a situation he would rather have avoided and in a context he could never have anticipated. A few months before his death in 1988, Rabi was hospitalized for a short time. His physicians wanted to understand his physical state as completely as possible, so Rabi was taken to the hospital's MRI facility and he was slowly rolled into the cylindrical magnet that plays a role something like the magnets in Rabi's molecular beam apparatus. In this magnetic field, the hydrogen atoms in Rabi's body could be detected by the magnetic resonance method and a cross-sectional image of his body generated, thereby providing physicians with detailed information about his physical condition. Once inside the apparatus, Rabi saw a distorted image of his face reflected in the shiny metal cylinder surrounding him. Rabi looked at his image. "It was eerie," said Rabi. "I could see myself in this thing. I would never have dreamed that my work would come to this. "11 A few weeks later, Rabi died peacefully at home.